A burn is damage to an area of the body caused by excessive heat, chemicals, electricity, or the Sun. Burns caused by heat can be the result of contact with fire, scalding water, or hot surfaces. Contact with high-voltage power lines can result in electrical burns. A burn can occur on the inside or outside of the body and can range from minor to life threatening. tissue is also damaged, the burn is referred to as full thickness. However, the depth of a burn is more commonly classified by a system of degrees. The size of a burn is also considered in determining its severity. According to the percentage of the body surface affected, burns are classified as minor, moderate, and major. The skin is the largest organ of the body. It covers the outer surface and prevents bacteria, dirt, and other foreign materials from entering the body and causing infection. The skin also aids in regulating body temperature through the process of sweating. Sweat regulates the amount of heat lost from the surface of the body, thus maintaining an even body temperature. In addition, the skin protects against the loss of body fluids that lie beneath it and bathe the tissues. A first-degree burn is restricted to the outer layer of the skin, or epidermis, causing redness and pain. A mild sunburn or an injury caused by briefly touching a hot pan are examples of first-degree burns. Dermis: The layer of skin lying beneath the outer skin. 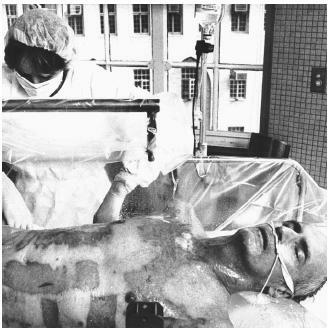 Skin graft: The transfer of skin or skin cells from an uninjured area of the body to a burned area in order to replace damaged skin and promote growth of new skin. A skin graft may be "harvested" from the actual burn victim or may be acquired from a donor. A second-degree burn is marked by the appearance of blisters on the skin. The burn damage extends through the epidermis to the underlying inner layer, or dermis. The formation of blisters indicates the loss of fluid from cells, and the skin is mildly to moderately swollen and painful. Second-degree burns can be caused by exposure of the skin to sunlight or by contact with a hot object or scalding water. A third-degree burn causes damage to the epidermis, dermis, and the underlying tissue. There are no blisters, but blood vessels in which blood clots have formed are noticeable. A fourth-degree burn is one that penetrates the tissue and extends to the underlying muscle and bone. It is the most serious type of burn and is often fatal. Such a burn can result in permanent disfigurement and loss of function of the burned area. Treatment includes replacing lost body fluids, removing destroyed tissue and charred skin, preventing infection, and grafting skin to replace the burned skin. Physical therapy is usually necessary to restore the function of the affected area. A fourth-degree burn results most often from the direct exposure of skin to open flame. Chemical burns can occur from ingesting chemicals or having them come in contact with the skin, eyes, or mucous membranes. Some 25,000 industrial chemicals can produce chemical burns. Certain household chemicals, such as drain openers, are also responsible for serious burns.